Micro LED Display Market size is projected to surpass USD 250 million in 2018, with shipments forecast to grow at over 115% CAGR from 2018 to 2024. The increasing demand for fine pitch panels is expected to propel the micro LED display market growth over the forecast timespan. The panels are being increasingly used in applications, such as outdoor displays, for businesses due to their properties such as high-brightness, self-illumination, and vivid colors. These components provide high wavelength uniformity suitable for fine pitch panels, thereby increasing the demand for micro LED display market. The growing trend of miniaturization of electronics is encouraging the manufacturers to reduce the panel size used in several applications including handheld devices and near-to-eye displays. Furthermore, miniaturization between each pixel lowers the cost of displays as compared to the traditional components. Due to this, these components are expected to be increasingly used in small electronic devices such as smartwatches and smartphones, thus propelling the micro LED display market growth. The micro LED display market is in the development phase and lacks well-established distribution channels, making it difficult for the manufacturers to switch from traditional components to technologically-advanced components. Additionally, due to the newness and lack of awareness regarding the technology, there exists no patent portfolio. This hampers the industry growth in the short term but provides opportunities to the players in the long run. The micro LED display market is will witness a considerable growth due to increasing applications in near-to-eye devices such as AR and VR headsets which is expected to reach over USD 1.5 billion by 2024. The The growing penetration of AR/VR technology in gaming, healthcare, and entertainment applications is creating opportunities for the compact and small-sized panels with high brightness and low costs. AR and VR devices require components with high restrictions on their size and weight to attain user satisfaction. These components also provide the required amount of brightness and contrast ratio for near-to-eye devices, aiding the market growth. The micro LED display market will witness increasing penetration in smartwatches to grow at a CAGR of 100%. Several technology giants, such as Apple, Inc., are investing in the technology to modify their near-to-eye devices. For instance, in April 2018, Apple announced the partnership with Taiwan Semiconductor to invest in R&D on micro LED panels for their smartwatches. These components provide lightweight and low-power alternatives to the traditional LED or OLED panels. However, the production costs of these components are projected to be higher and are expected to be incorporated only in high-end Apple watches. The small micro LED display market is expected to grow significantly with a CAGR of over 105%, owing to the increasing use in applications including smartwatches, smartphones, and near-to-eye devices. These components significantly lower the size of devices that allow their adoption in small electronics such as smartphones. These components have a response time of a few nanoseconds and are suitable for applications in smartwatches and AR/VR devices. 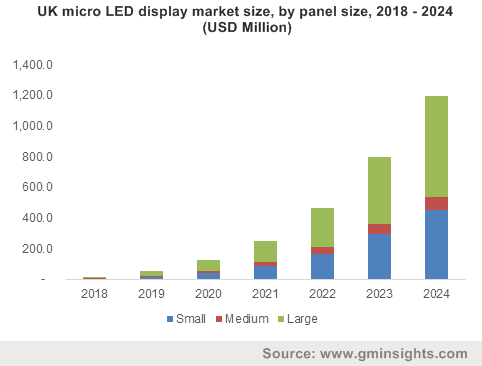 The large micro LED display market will experience a rapid growth to exceed shipments of 35 million units by 2024 due to the increasing use of the technology in the digital signages, particularly in indoor applications. In January 2018, Samsung announced the launch of its 146-inch micro LED modular panels. The size of these panels can be increased and decreased as per the requirement for outdoor and indoor public displays. The closer spacing of LEDs in these panels and the reduction in size allow high-resolution images and videos, aiding the micro LED display market growth. The U.S. micro LED display market is expected to witness a significant growth to reach over USD 7 billion by 2024. The growth is attributed to the increasing demand for electronic devices such as smartphones, tablets, and smartwatches. In 2017, the smartwatch sales in the U.S. accounted to approximately 12 million and is projected to increase further. The increasing usage of these components in wearable devices will increase the micro LED display market growth over the forecast timespan. Asia Pacific micro LED display market will increase rapidly due the increasing penetration of smartphones in the region. Furthermore, the presence of several manufacturers in the region makes it cost-effective for the manufacturers to switch from the production of traditional displays to micro LED displays. Increasing interest of electronic product manufacturers, such as Panasonic, LG, and Samsung, are encouraging the panel manufacturers in the region to invest in the development of facilities for the production of these components. 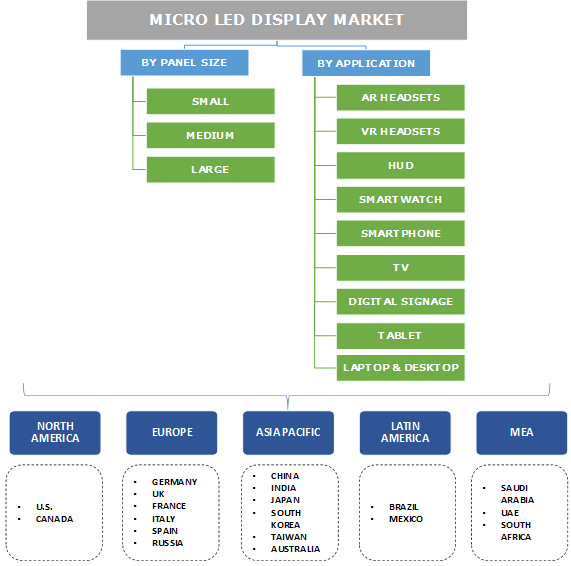 The key players in the micro LED display market are LG Display, Apple, Inc., Samsung Electronics, Sony, Sharp Electronics, Epistar, Oculus VR, AU Optronics, X-Celeprint, JBD, VerLASE Technologies, and Aledia. The newness of the industry is encouraging investments from innovators such as ALLOS Semiconductors, Mikro Mesa Technologies, PlayNitride, Plessey Semiconductors, VueReal, and Ostendo Technologies. Furthermore, several research institutes such as, Changchun Institute, China, the Industrial Technology research Institute, Taiwan, CEA Leti, Fraunhofer-Gesellschaft, and III-V Lab France, are undertaking R&D for the mass-production of these components. The micro LED display market is characterized by intense competition, thus leading to the acquisition of small players by the technology giants. For instance, in 2014, Apple acquired LuxVue Technology, a technology company that worked on the micro LED display. The company possesses several patents relating to the technology and is expected to apply the technology in the next-gen Apple watches. The miniaturization of electronics and components is encouraging the manufacturers to reduce the size of the panels. The technology combines LED and LCD features to develop a mature technology in terms of equipment development as compared to OLED technology. The manufacturing of these products is difficult & expensive and thus, the companies are introducing products with small panel sizes for applications such as wearable devices. The average LED chip measures about 100 to 500 microns, whereas the companies are expanding their research to develop micro LEDs with about 4 to 5-micron thickness. Advanced product specifications, such as high brightness and lightweight, are encouraging the device manufacturers to switch to the micro LED, propelling the micro LED display market growth.